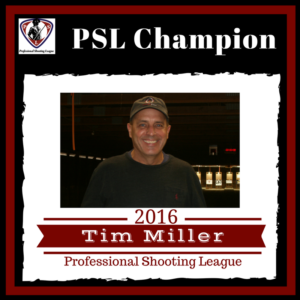 PSL 2016 wrapped up with Tim Miller of Georgia holding the trophy and the cash! Tim topped the points list with 379 total points after his great finishes at each of the four PSL matches held for the 2016 PSL Season. Congratulations Tim! Second place went to Todd Wooten of Ohio with 367 total points. And, Tony Harper of Pennsylvania with 362 points finished third. Great shooting guys! Celebrate the 2016 wins and make plans to Show Up and Shoot in 2017!